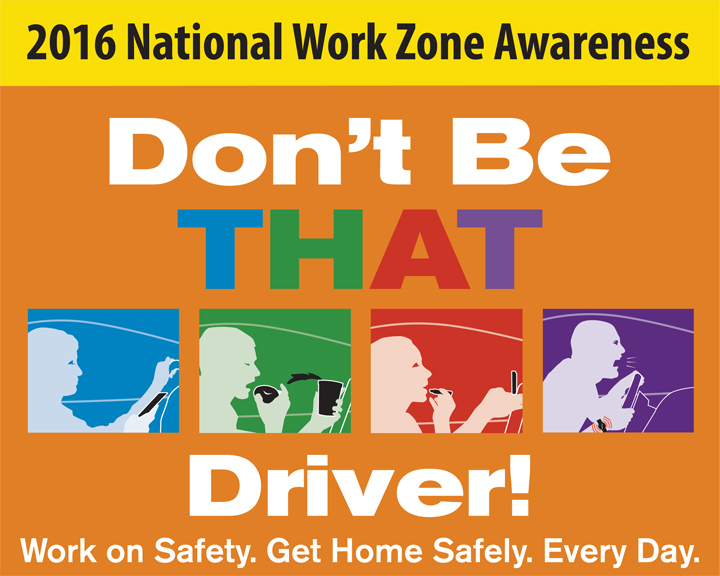 The week of April 11-15, 2016, the Federal Highway Administration encourages, “Don’t Be THAT Driver!” This year’s National Work Zone Awareness theme focuses on a current road safety topic: distracted driving. Construction zones are dangerous enough without mixing in the added hazard of driving distractions. With so much confusion going on in a work zone, taking your eyes off the road, hands off the wheel and/or mind off of driving, even for a second, can lead to an unfortunate crash. Besides being aware of in-vehicle distractions also avoid the temptation to try and see what the road workers are doing. Remember to slow down to a safe speed, drive more cautiously and focus on the task at hand. Today marks the close of 2015 National Work Zone Awareness Week which advised drivers to “Expect the Unexpected”. Road worker safety is always good to have in the forefront of your mind, especially in the coming summer months as road construction will undoubtedly increase. The main thing to remember when you see orange (signs, cones, and vests) along the road is slow down and drive more cautiously. Keep your focus on navigating through the changing lanes, speeds and road conditions. The smallest distraction could be disastrous. Obey the posted construction signs and workers giving you instructions. And if safety for all is not a good enough motivator, remember almost all states have larger fines for speeding and other traffic infractions in a construction zone.